Amisha Gandhi, VP, influencer marketing, SAP Ariba, says that, just as in one’s personal life, worthwhile relationships take more than numbers-flexing on either side. In her 2017 Content Marketing World talk, Creating a Global Influencer Marketing Program at a Large B2B Brand, Amisha shares what she learned about using proactive, reciprocal actions to build successful relationships between SAP and industry personalities. Choose the right influencers to meet that goal. Keep influencer relationships warm and give as much as you get. Equip internal teams and influencers with tools to help programs succeed. Let’s dive deeper into Amisha’s explanation for each directive. Amisha started SAP’s program with, as she put it, “a blank slate.” No centralized, global influencer marketing existed at SAP before late 2015. Rather than create a worldwide program all at once, Amisha planned a phased rollout that would result in learning she could build on for future programs. For the pilot project, she set her sights on SAP Sapphire 2016, an annual event that attracts 20,000 CIOs and IT professionals and was mere months away. She needed to create an influencer program that complemented the existing marketing campaign and set goals she could meet in the short timeline. That clarity of purpose helped the team zero in on everything from selecting the right set of influencers to how to use the materials created. While B2C influencers tend to be celebrities, B2B influencers should be people your potential buyers trust for advice. 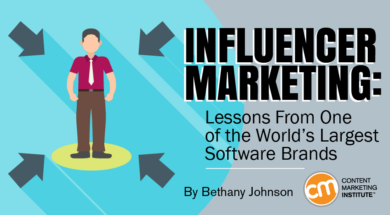 Even then, it makes sense to understand the varying approaches, offerings, and sway of different kinds of B2B influencers. Authors and academics tend to produce books, keynote presentations, educational materials, popular blogs, videos, etc. Industry analysts, commentators, consultants, and partners are known for in-depth research, speeches, reports, thought-provoking conversations (or predictions), and an active social presence. Vocal bloggers, journalists, and subject matter experts crank out articles, books, and guest contributions for popular industry publications. Online communities, professional groups, and industry forums produce events, publications, and industry standards. Executives, chief evangelists, and product managers are great for co-producing white papers, books, and dynamic speeches. Employees, vendors, users, and partners can be tapped for influential case studies, video testimonials, and social sharing. Business colleagues and professional acquaintances influence their circles with water-cooler conversations, emails, and social media. Decide: Influencer relations or influencer marketing? Influencer relations involves top-of-funnel awareness-building (such as events and coverage). At most companies, that’s covered by PR and analyst relations teams who work to earn coverage from journalists, bloggers, and top-tier analyst firms. Influencer marketing serves a deeper part of the funnel. Independent analysts, consultants, and other tech experts whom the desired audience and potential buyers already rely on for purchasing guidance make sense here, as do partners and customers. Once she knew what kind of influencers to invite (tech experts, independent analysts, etc. ), outreach began. A lot of people believe SAP’s name naturally attracts responses. But that’s not the case. The trick, Amisha says, is simply to introduce yourself, compliment the influencers’ relevant work, and ask how they engage with brands. Focus on scoring an initial conversation. And be persistent. One of Amisha’s targets didn’t initially respond to her emails. Amisha sent direct messages to him on Twitter, Facebook, and LinkedIn. He finally responded, but said he wasn’t interested in SAP. Amisha convinced him to give her 30 minutes, which she used to fill him in on developments at the tech giant that he never heard about. Not only did he agree to participate in the event, she now considers him one of her most supportive influencers. She also set the expectation Sapphire influencer program would be “SAP inspired but influencer lead.” That meant asking internal stakeholders to educate and inform the influencer group without exerting control over the resulting content. In the end, the 11 influencers accounted for 16.5% of social media impressions from the event. And the results (and learnings) kept coming as Amisha and team expanded into new areas, including sponsored blogs on The Guardian, other industry events, webcasts, and more. At Sapphire 2017, 15 influencers who attended drove 25% of all social media impressions. When done right, your pilot program takes on a life of its own. In fact, it can become a thriving, remunerative program that (next year) gets the line item it deserves. Once you build successful relationships with influencers, Amisha advises, don’t let them get cold. Check in regularly, even when you’re not working with them on a project or asking them to do anything. During these check-ins, share information about what your company’s doing, Amisha advises, and make sure to ask what the influencers are working on. Look for ways to add value for them too. Amisha gives the example of an interactive e-book SAP compiled with insights from 32 industry thought leaders. When the piece was released, the contributors shared it with their followers, and the e-book ultimately earned 18 million impressions. The reach and authority of the influencers certainly helped SAP. But, perhaps best of all was the unexpected by-product: a newly established camaraderie among the authoritative voices the book engaged. Connections Amisha fostered among her influencers prompted three of them to work together to start a webcast series. A quarterly check-in gives you another important benefit: the opportunity to watch for a cooling of the relationship. Collaborating is always fun … at first. Keeping your finger on the pulse of that relationship can determine what becomes of your program. 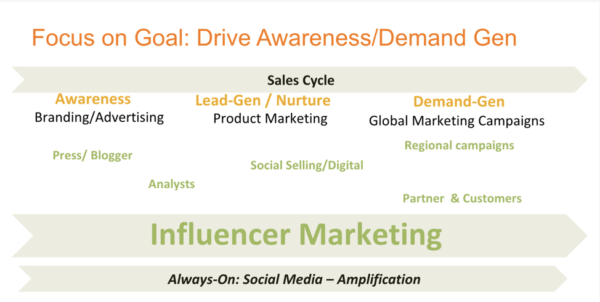 Few influencer marketing programs equip influencers with thoughtful, tactical help. As you piece together a pilot program, consider offering your influential guests some or all of these tools. Outfitted with a list of things to expect, influencers are able to pre-write their tweets, draft rough blog posts, and brainstorm ways to put their own unique spin on each agenda item (except maybe lunch). This way, they’re free to create more spur-of-the-moment reactions in real time. Amisha explains a scenario she witnessed at the most recent SAP Leonardo Live event, where influencers were attempting to produce livestream videos with shaky smartphones and distracting background noises. Her team offered the use of SAP’s state-of-the-art equipment and crew, and a special thing transpired organically. One of the influencers used the opportunity to interview another influencer on site. “There’s a big SAP logo in the background, but they really talked about how at the event we’re talking about machine learning, AI, IoT, big data, and analytics. And they were talking about it from a different point of view, what they were taking away, what they were thinking about the topics, what they’re hearing in the market.” The best part? The duo got on a roll and found themselves naturally bragging on the event’s sponsor. Eye-catching photos, smart copy, and important details: What influencer has the time to create compelling graphics to promote your event on social? Take a page out of SAP’s playbook by crafting customizable designs to share online. Amisha’s team learned a lot from that initial outing at Sapphire and the influencer marketing done since. At a company SAP’s size, though, a single team can’t plan a program for every relevant event. 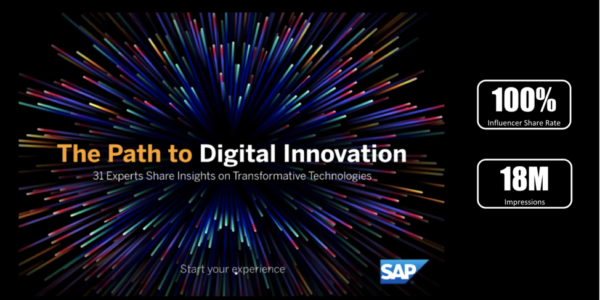 Instead, SAP created what Amisha calls an “event plan in a box” that lists all the steps other internal teams at SAP can adopt for their events – from strategy to program design to execution at the event to post-event promotion. SAP is an inspiring example of what reciprocity with different types of influencers makes possible. Whether yours is a 100-year-old, trusted brand, an unknown ground-floor venture, or (most likely) somewhere in between, you can apply what Amisha has learned to build your own B2B influencer marketing program from scratch or improve the one you have. How are you using influencer marketing? Tell us your story in the comments below. What inspiration and guidance will 2018 Content Marketing World bring? Check out the full schedule and register before May 31 for early-bird savings. Plus use the code BLOG100 to save an additional $100.